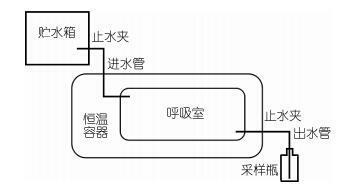 杨小东, 江兴龙, 乐普敏, 龚铭杰. 2019. YANG Xiao-Dong, JIANG Xing-Long, LE Pu-Min, GONG Ming-Jie. 2019. Oceanologia et Limnologia Sinica, 50(2): 455-464. YANG Xiao-Dong, JIANG Xing-Long, LE Pu-Min, GONG Ming-Jie. 2019. STUDIES ON OXYGEN CONSUMPTION RATE (ROC), ASPHYXIAL POINT (AP) AND OPTIMUM WATER TEMPERATURE RANGE (RT) OF ANGUILLA ROSTRATA AND LC50 AND SC OF NON-IONIC AMMONIA (NIA) AND NITRITE IN WATER[J]. Oceanologia et Limnologia Sinica, 50(2): 455-464. Abstract: Study on the oxygen consumption rate of Anguilla rostrata and resistance to water temperature, low dissolved oxygen, non-ionic ammonia and nitrite nitrogen. This study used a self-made fish breathing apparatus to measure eel oxygen consumption rate and asphyxiation point. Resistance of eel fingerling to water temperature, non-ionic ammonia and nitrite nitrogen was determined. The results showed that diurnal variation of the oxygen consumption rate of A. rostrata, the oxygen consumption rate during the daytime was (86.46±37.77)mg/(kg h), at night (123.58±22.56)mg/(kg h), and there was significant difference between them (P < 0.05). 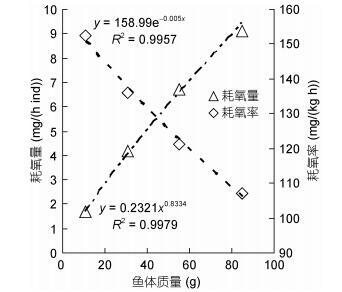 At the range of 15-30℃, the oxygen consumption rate was gradually increased with water temperature up, the relation formation between oxygen consumption rate and water temperature as y=-0.1316x2+9.4507x-13.712, (R2=0.9993). 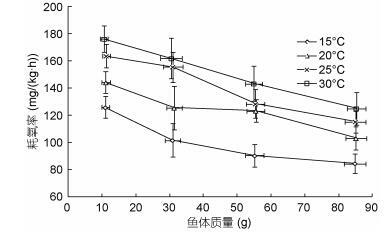 The oxygen consumption rate decreased with body mass up, but the amount of oxygen consumption increased with body mass up. The relationship between oxygen consumption and body weight was y=0.2321x0.8334 (R2=0.9979). At the water temperature of 25℃, the asphyxial point decreased with fish mass up. Average eel individual weight at 10g, 40g and 160g, the dissolved oxygen concentration at the suffocation point of eel was 0.98±0.25, 0.46±0.06 and 0.32±0.02mg/L, respectively. 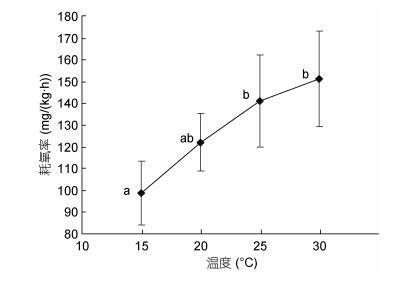 The optimum water temperature range for A. rostrata was 13-29℃, however 25-29℃ was the optimum water temperature range for good growth, and in a certain range of short time low water temperature or high water temperature environment to its damage was reversible in some. The LC50 and SC of non-ionic ammonia in water for A. rostrata was 12.22mg/L and 1.22mg/L respectively, and the LC50 and SC of nitrite nitrogen was 61.68mg/L and 6.17mg/L respectively.